If there's anything of particular interest to you, feel free to contact Mr. Morosco for further information. Visit our Sample audio section. A virtuostic set of twelve unaccompanied classical and jazz influenced variations on the blues for solo alto saxophone. Special offer: Blue Caprice Sheet Music and Double Exposure CD for $25.00! One movement saxophone quartet ballad featuring a beautiful soprano saxophone solo. Includes written solo which can be optionally improvised. A 3 movement virtuosic tour de force with both classical and jazz elements. This work is fully composed however one has the option to improvise where indicated. Inspired by a visit to Monte Casale, a hermitage in Sansopolcro, Italy. It is a spiritual piece of moderate difficulty with an improvisational quality. 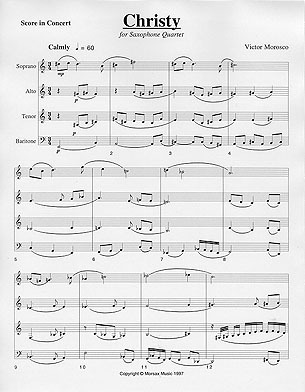 A programmatic work consisting of three separate pieces inspired by Monterey Bay in Central California. One movement saxophone quartet based on the blues with a baroque influence. 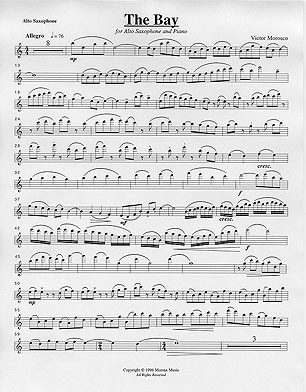 A traditional woodwind quintet in three movements with the Alto Saxophone in place of the French Horn. 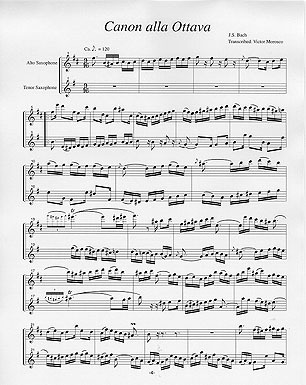 A technically and rhythmically challenging piece with a jaunty third movement that is fun and challenging to play. A fully composed four-movement jazz oriented work with optional improvisation where indicated, based on the traditional symphonic Sonata form with a jazz waltz in place of the minuet. The first movement "The Fourths of Firth" is inspired by the Clarinet Concerto by Aaron Copland and Clarinetist Andrew Firth. High degree of technical difficulty. 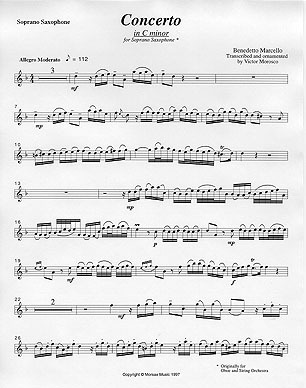 A collection of new and transcribed short pieces from the works of Victor Morosco for the Saxophone or Clarinet. Originally designed for the younger instrumentalist many of these pieces are being found on programs of professional artists throughout the world. 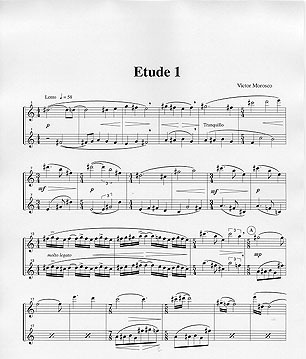 Pieces vary from 1'30" to 5' in length and are ideal for contests or adjudication performances for younger players as well as use as a group in recitals. Slow ballad written for Richie Cole with written solos or optional improvisation for Solo Alto Saxophone. A four-movement work for the advanced saxophonist with strong jazz influence. Six original duet etudes for saxophone in a broad variety of contemporary musical styles, encompassing tonal, atonal, twelve tone and jazz. 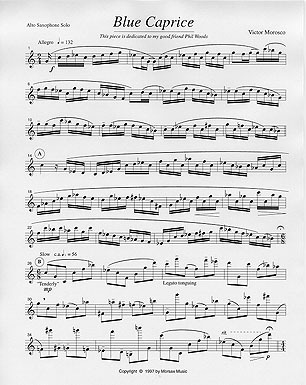 Four Canons from the "Art of the Fugue"